Have you noticed your hearing isn’t what it used to be? You aren’t alone. Around 37.5% of all adults in the United States alone report hearing problems of some kind. With numbers like that, there have been several options created that can help. If you think you are one of these people, then you have come to the right place. We’ve created a guide to tell you everything you need to know about this issue. Keep reading below to learn what conductive hearing loss is, how it happens, and what you can do about it. There are two main types of hearing loss: conductive and sensorineural. Conductive hearing loss happens when there are obstructions in your ear that prevent it from conducting sound the way it would normally. These issues can occur in the ear canal, eardrum, the bones in your middle ear, or a combination of all three of these areas. When these obstructions occur the sound entering your ear is dampened, which causes less sound to enter. Some common problems can lead to these conductive problems. Some of them can be handled more easily than others. Some hearing loss happens over time, while other times it occurs suddenly. If you have a sudden occurrence of hearing problems, then check for any ear wax buildup as this can cause an obstruction. Infections in the ear can cause problems in a few ways. It can cause both fluid build-up and inflammation. If the infection causes any inflammation, your ear can have issues with conductivity. This can interfere with your ear’s ability to move sound through the ear. Fluid build-up can cause dysfunction in your eustachian tube. This section of your ear links parts of your ears together, which when disrupted can result in the sound not to go where it needs to. In more severe cases, problems with eustachian tube dysfunction can cause your eardrum to collapse. This will cause complete deafness in your ear. Your eardrum can also be damaged through physical activity or loud noise and end up with a hole. When this happens, it can’t collect all the sound passed to it and disrupts your hearing. You may not want to hear this, but genetics can be a factor for hearing loss. This can take place in two ways. The first is known as syndromic. It involves the malformation with parts of your body. With hearing, this includes your external ear and the internals of your ear. This can cause problems over time which increase the chance of hearing issues. The second genetic cause is nonsyndromic. There are no known visual malformations in this case. Instead, it is thought to be the result of abnormalities in your middle ear or inner ear. Many people think of lousy hearing as a sign of getting older that you can’t do anything about. Depending on the type of hearing loss, though, you can slow the progress and treat it. If you think you are suffering from conduction hearing loss, then look for the following symptoms. Luckily, hearing loss isn’t a lost cause. What used to cost a lot of money can now be treated affordably. Here are the things you can talk to your audiologist about when learning about your treatment options. Earwax is a simple thing to fix. All you need to do is clean your ears. However, sometimes a cotton swab isn’t enough to do the job. Sometimes ear wax hardens in your ear, making standard methods ineffective at removing it. In recent years there have been new methods developed to take on this problem. One commonly prescribed product by doctors is a syringe that will remove the hardened ear-wax effectively. These syringes allow you to inject liquid into your ear, softening the ear wax making it easier for you to remove. 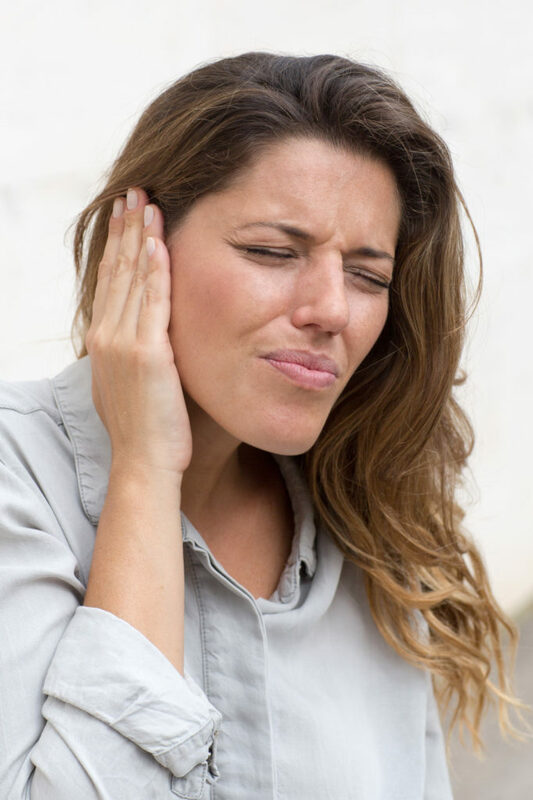 In the case of a damaged eardrum surgery may be necessary to fix the problem. There are a few different surgery types that you can consider here. PE tubes are the first surgery type. While they are commonly used for children, adults can also benefit from them. These tubes open up your ear to allow more airflow to improve your hearing. The second surgery is a stapedectomy. This surgery involves placing a prosthetic device, which helps bypass the hardening of your inner-ear bone. Not everyone wants surgery. Until recently there hasn’t been a viable alternative to it. This is where bone conduction implants come into play. Bone conduction implants work by implanting a small device in your ear. This device will capture sound and then send the vibrations through your ear. These vibrations head to your inner ear, meaning the problem areas you have are then bypassed. While implants aren’t as invasive as surgery, some people do see skin complications after treatment. Hearing aids used to be expensive. That has changed in recent years and now are affordable for everyone. A hearing aid works by helping transmit sound to the parts of your ears that aren’t receiving it correctly. Aids are an easy to use treatment option that isn’t invasive and still gives you the results you need. This makes them one of the most popular ways to deal with hearing problems. Now that you have what you need to know about conductive hearing loss it’s time for you to take action. If you are considering a hearing aid, then make sure to read our article on picking the right product.